Secondary Fracture Prevention: An International Perspective presents practitioners and academic clinicians with a better understanding of secondary fracture prevention and models of care from a variety of settings and countries. This must-have guide provides practitioners and academic clinicians with essential information about this broad clinical and research topic that extends across the globe. Preventing secondary fractures starts with assessing what works and what does not work, reviewing major society guidelines, and what workup and management is necessary. 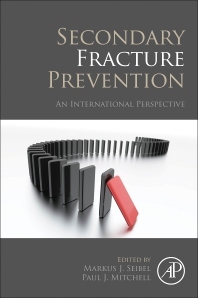 This book reviews these topics and provides the rationale for pursuing a workup to prevent fractures in this patient population. 1. Introduction: Why secondary fracture prevention? Markus J Seibel, MD PhD FRACP FAHMS, is Professor of Endocrinology at Sydney Uni¬versity. He is the Inaugural Director of the Bone Research Program at the ANZAC Research Institute, and heads the Department of Endocrinology & Meta¬bolism at Concord Hospital, Sydney. His research in musculoskeletal biology covers topics such as glucocorticoid signalling in bone and its effects on bone and systemic fuel metabolism and ageing; the biology of bone metastases; and the clinical efficacy of secondary fracture prevention programs. Prof Seibel has published over 400 scientific papers and is the editor of 8 books. In 2017, he has been elected to the Australian Academy of Health and Medical Sciences. Prof Seibel is a Past President of the Australia and New Zealand Bone & Mineral Society (ANZBMS), a Member of the Board of Directors, International Federation of Musculoskeletal Research Societies (IFMRS), and the Chair of the Australian National Alliance for Secondary Fracture Prevention. Dr. Mitchell is the Managing Director at Synthesis Medical NZ Limited. His primary goal is to improve management of chronic disease by closing care gaps through systematic implementation of evidence-based practice. Dr. Mitchell has spent the last decade developing policy, guidelines and systematic approaches to hip fracture care and prevention throughout the world. He spent the previous 15 years working in the pharmaceutical industry, initially as a basic researcher in neuroscience and, subsequently, in sales, marketing and osteoporosis service development roles. Specialties: Systems-based approaches to chronic disease management, osteoporosis, fragility fracture prevention, orthogeriatrics, fracture registries, dementia care, policy development, literature review, medical education, website content development.